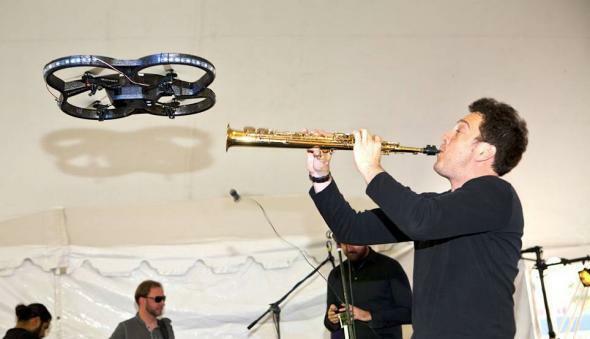 How to make music with drones. In my musical career, I’ve jammed with nightingales, humpback whales, and 17-year cicadas—so when I was asked to do this piece for Emerge, I figured, “Why not?” and got to work on planning. At first I wanted the drones to sing, or at least give voice to their secrets and struggles, but it turned out that even a Bluetooth speaker weighing a few ounces would mess up their navigability. No wonder the real practical drones cost thousands of dollars each. I couldn’t get away from the idea of remote-controlled killing machines dispatched to war zones to eliminate enemies we are too frightened to confront in person. I know, these killings are supposed to be effective and precise, but there is something genuinely creepy about the process. So I decided that in my piece the drones would be talking—confessing to their crimes. Of course, I know they are only following orders. In rehearsing the piece, we had some debate about whether it was better to trust humans or computers to pilot the drones. The programmers shook their heads as the students made all kinds of errors trying to pilot the machines with their smartphones, and they showed off programs that could make the copters do all kinds of reliable tricks in the air, over and over again. “See,” they said, “no human can be as accurate as this.” These are the same people who are programming our cars to drive themselves—“There are some things machines just do better than us.” Meanwhile, the rest of us shook our own heads. We don’t even want toy helicopters flying themselves. In the end we went with the human pilots, trusting our own errors more than programmed precision. The mistakes that happened during performances—dropping to the floor, flying in the wrong direction—made the drones seem all the more fallible and alive. It was hard to tell who was responsible for the flubs: the pilots or the piloted. But the mistakes weren’t bad: It is when a drone does something unexpected that it most seems like something worth making music with, dancing with, or engaging with. Correction, March 19, 2014: This blog post originally misspelled the first name of Bertolt Brecht.